Happy Wednesday! Hope your week is going well! This is the last week of one of my classes, so I have been busy finishing up work and taking my final! Ready for this week to be over so I don't have to worry about it anymore! Anyway, I recently found this sweater at Marshalls (linked similar options above), & I am loving it! Ruffles have been and still are very much IN. I am still not so sure how much I love the big chunky ruffles on some of them, but I am beginning to warm up to the idea. 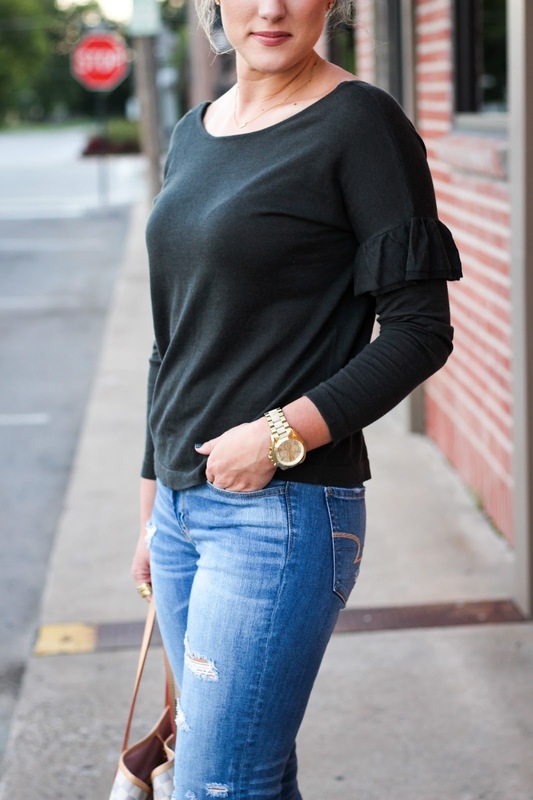 My favorite ripped jeggings are on sale for $34! It FINALLY felt like Fall yesterday and I loved every minute of it! I just wish it would stay chilly outside!